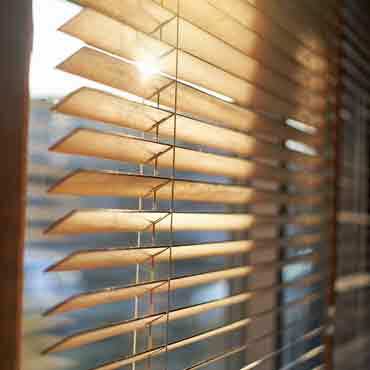 Wood blinds consist of horizontal wood slats that can be tilted open or close for light control and privacy. Like fine furniture, wood blinds add a special touch of warmth and rich, natural beauty to any room. Wood blinds are available in 1-inch, 2-inch, 2 5/8-inch and 3-inch wide slat sizes, in a full range of finishes, from stains and paints to a rougher sandblasted finish. The 1-inch slats create a busy look, limiting your view to the outside. Based upon your specific situation though, you may need a 1-inch slat size. Wood blinds made with 2-inch wide slats provide a traditional look and are the most popular of the widths available. The 2 5/8-inch and the wider 3-inch slats provide a shutter look and offer a less obstructed view to the outside; because the slats are wider, it takes fewer slats to construct the blind and thus the slats rest farther apart. Wood blinds are constructed out of two different types of wood 1) American hardwood and 2) Ramin wood. Wood blinds are durable, naturally insulating and easy to maintain.